In this tough economy, many companies have been forced to look for alternatives to steel strapping. Polyester strapping (PET) is one solution. Traditional steel users are reluctant to change. However, PET strapping is safer, easier to use and more cost effective. The new Fromm range of equipment ensures Australian Warehouse Solutions (AWS) PET straps deliver ideal loads. AWS PET strap enjoys consistent tensile strength and elongation, which absorbs shock and impact during transportation. PET does not have any sharp edges and is less likely to cut hands during handling, application and removal. Nor does it rust. 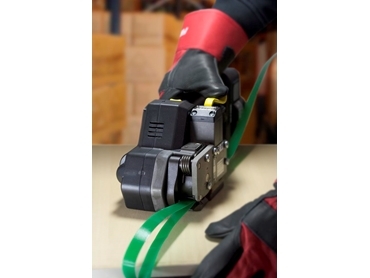 P325, from Fromm , is a new generation battery operated tool that is designed specifically for the application of PET straps. The Fromm P325 is a lightweight, ergonomically designed, one handed operation tool. Tim Schiemer, Machinery specialist for AWS said, “The Fromm P325 is the latest innovation in the world’s strap industry. This tool can cater for strap up to 19mm and is perfect for industries with traditional hard areas such as brick, timber and steel. “The money saved from using PET strap usually pays the cost of acquiring the new tool. AWS offer the option of renting or buying the tool,” said Tim Schiemer.